Members, visitors and guests helped the Reedwood Friends Church, located north of Reed College, S.E. Steele Street, to celebrate their 125th anniversary – during the morning services and at an afternoon luncheon on Sunday, November 4. The congregation that became Reedwood Friends Church began informally back in 1890, when a couple started the "Portland Monthly Meeting of Friends Church" in a schoolhouse near East Harrison Street and Marguerite Avenue (now 35th Avenue), according to the church's Interim Pastor, Margaret Fraser. The congregation moved to East 36th Avenue and Salmon Street in 1900; then, needing more space, they built a church in the Sunnyside neighborhood in 1905; followed a decade later by an even larger church, occupying it in 1918. But they weren't through yet. In 1970, after the church leadership bought the former Lambert Nursery, across the street on the north side of Reed College, the congregation moved into a new church, and adopted their current name, Fraser told THE BEE. During the church service on November 4th, the congregation sang, listened to the choir, and heard a message touching on the church's "quasquicentennial" achievement. "When it started, the founders had no idea of the outreach and growth that this community of faith would experience, remarked the main speaker of the day, Irv Brendlinger, PhD, a retired George Fox College professor. "Today, we embrace and support our own Latina ministry; and, there's a healthy number of professors that teach at George Fox University," Brendlinger observed, as he discussed many notables who went on to lead Christian universities, and become teachers. "This community has been a safe place for those who sometimes describe themselves as 'recovering fundamentalists'; and certainly it is a safe place for those that consider themselves 'seekers'." The aroma of pork chops on the grill in the kitchen of the church's Community Hall downstairs signaled that luncheon was to come for the many guests present. 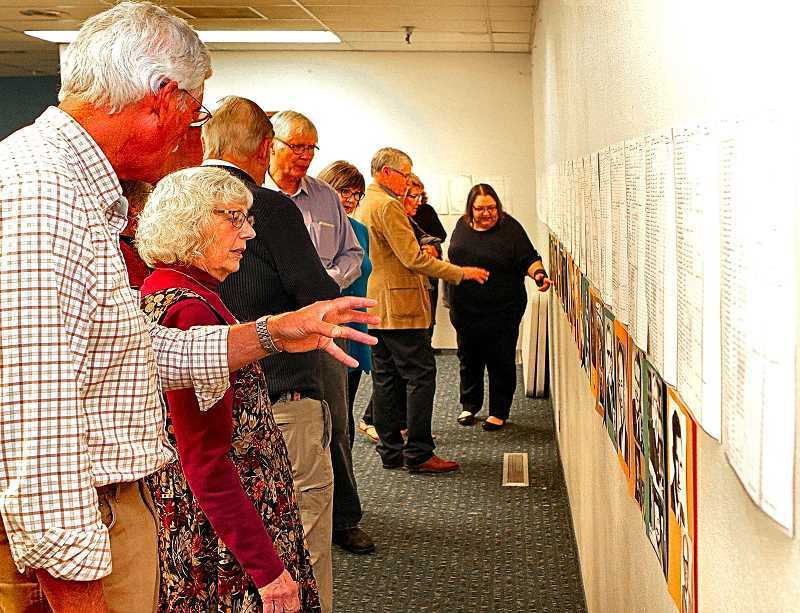 After the service, members and guests were invited to look at exhibits detailing the church's history, before turning to the delicious lunch that awaited them.